Architecture and Engineering at Gap Inc., to the ONUG Board. Comprised of leading IT executives, the ONUG Board is slated to convene and share insights on the importance of open interoperable hardware and software-defined infrastructure solutions May 9-11 at ONUG Spring 2016, hosted by Intuit in Mountain View, California. In his current role at Gap Inc., Vishal is responsible for global architecture, roadmaps, and strategy, as well as an engineering team responsible for delivering enhanced network and infrastructure services. 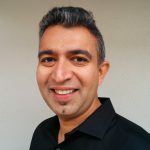 Having previously held positions at Restoration Hardware and Xerox, Vishal’s enterprise background includes comprehensive knowledge in IT deployments, network automation and orchestration, and the integration of new technologies into large enterprise ecosystems.